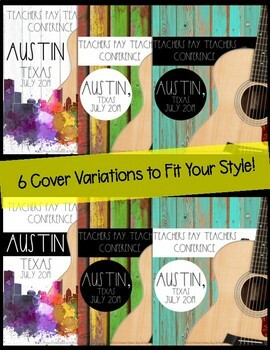 Who's excited about the conference in Austin, Texas!? To keep you organized, here is the conference binder I'll be bringing. It has pretty much everything you need. I hope you all enjoy this resource AND Nashville! ►In the past, I printed these pages and searched for each of the sessions I planned to go to. I printed the sessions out and placed them in order of when I would be attending. 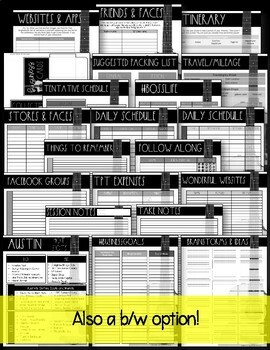 For sessions with no handout, I just printed EXTRA "Take Note" pages and added them there. This REALLY helped keep me from having to flip around my binder searching for available pages. All of the pages come in color and black/white for your own person printing preference. Pro Trip: Don't be shy. Not everyone will be outgoing. Take a chance and meet new people! Who knows, maybe you will make a lasting friendship! Don't forget to leave feedback. For each dollar spent you get 1 credit for your next purchase on the TpT site, IF you leave feedback. Also, please make sure it is fair feedback. Remember, I am a real person, who isn't perfect. If you find a problem, PLEASE email me first. Most likely, I can get it fixed for you the same day. This resource is NO WAY in affiliation with TeachersPayTeachers. 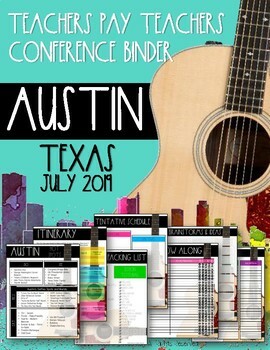 It is merely a resource to help fellow sellers stay organized at the 2019 conference.